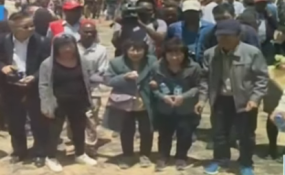 Family members visit the site of the Ethiopian Airlines crash. Some families asked the government to assist them to get compensation through legal representation while others asked the State to speed up the process of determining the DNA of their relatives. However, some of the grieving families have mixed feelings about government's support. The family of Immaculate Odera says that the bereaved have been left on their own following the Ethiopian Airlines plane crash that claimed the lives of 36 Kenyans. Speaking during a meeting between bereaved families and the Ministry of Foreign Affairs at the Kenyatta International Convention Centre in Nairobi, on Thursday, Ms Odera's widower Denis Adhoch said that he was concerned that his family and others had been left on their own. "We are grateful that we were supplied with air tickets to Ethiopia to see the crash site and the support the ministry is giving us," he said.